PLOT SYNOPSIS: With much of the world’s population now an undead horde, R is a young and oddly introspective zombie. While fighting with and feeding on a human scavenger party, R meets Julie and feels an urge to protect her. What happens next is the beginning of a strangely warm relationship that allows R to begin regaining his humanity. As this change spreads through the local undead population like a virus, Julie and R eventually have to face a larger issue when the very nature of their friendship is challenged. Caught between the paranoid human forces and the ferocious “Bonies”, zombies who are a mutual threat, R and Julie must find a way to bridge the differences of each side to fight for a better world no one thought possible. Well, this is different. A rom-com and zombie tale with a twist. The pop-culture specialist in me is very happy to have insight into the feelings of a particular zombie. Julie: R, Do you remember your name yet? Julie: Well, you know, you could just give yourself one. Just pick one. Whatever you want. Julie: Really? You don’t want to know what it was? You don’t want your old life back? R: No. I want this one. R says that it’s strange to meet a girl by eating her boyfriend’s brain. Ha! He cannot remember his old life but wears a ‘hoodie’ so he presumes he was unemployed. Ha! R: Say something human, say something human, say something human. How are you? Nailed it. This film plays with the Romeo and Juliet idea – the lead characters names are R and Julie. It is a little over ambitious on this count. This is an extremely simple tale and any resemblance to Shakespeare goes out the window but the theme of a taboo love certainly makes its mark. Critic Yasmin Vought says, “If you love the un-dead humour of Zombieland and Shaun of the Dead, but want an Edward Scissorhands-meets-Romeo and Juliet style romance on the side – then this is the film for you. 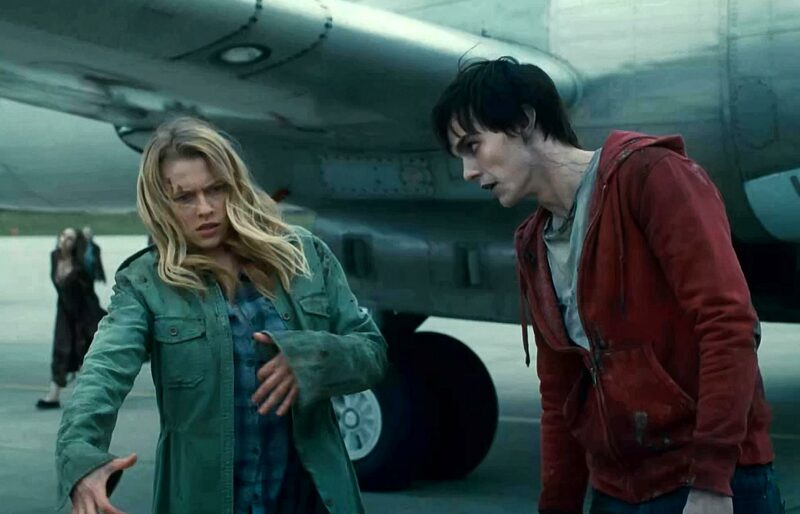 Rotten Tomatoes says this about the romance: A funny new twist on a classic love story, WARM BODIES is a poignant tale about the power of human connection. After a zombie epidemic, R (a highly unusual zombie) encounters Julie (a human survivor), and rescues her from a zombie attack. Julie sees that R is different from the other zombies, and as the two form a special relationship in their struggle for survival, R becomes increasingly more human – setting off an exciting, romantic, and often comical chain of events that begins to transform the other zombies and maybe even the whole lifeless world. Instead of eating her, R protects Julie from the other zombies. His teaching her how to walk slowly and to grunt like a zombie is hysterical. He smears brains on her face so that she will smell like a zombie. Gross but endearing. John Malkovich is in this film, which gives it a credible and unique standing. He plays Julie’s threatening father – he is likely to kill R, is militant and very anti-zombie. As usual, he is superb. The zombies are curing themselves by virtue of R and Julie’s feelings for one another. The answer to zombie-fate is seemingly human interaction and not a pill or a drug. A zombie with a heart is nostalgic for me. In the TV series ‘Buffy the Vampire Slayer,’ Buffy’s boyfriend was a vampire with a soul. I guess that a progression from vampire to zombie makes pop-culture sense. This film is nowhere near as brilliant as ‘Buffy’ but it’s worth a look-see.